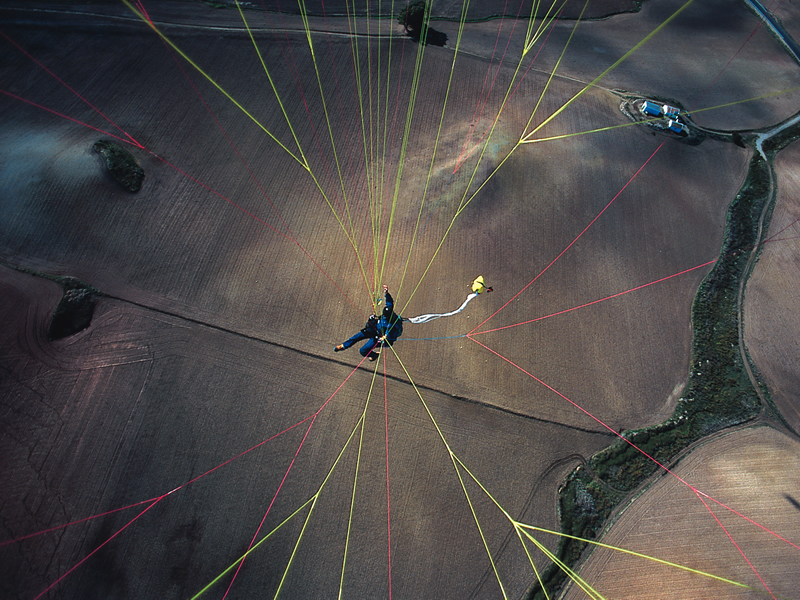 Back in 1995 the beamer started a new era in reserve parachutes for paragliders. Its rogallo concept changed the scene fundamentally. With the Beamer 2 light we reached a new milestone in reserve parachute development. 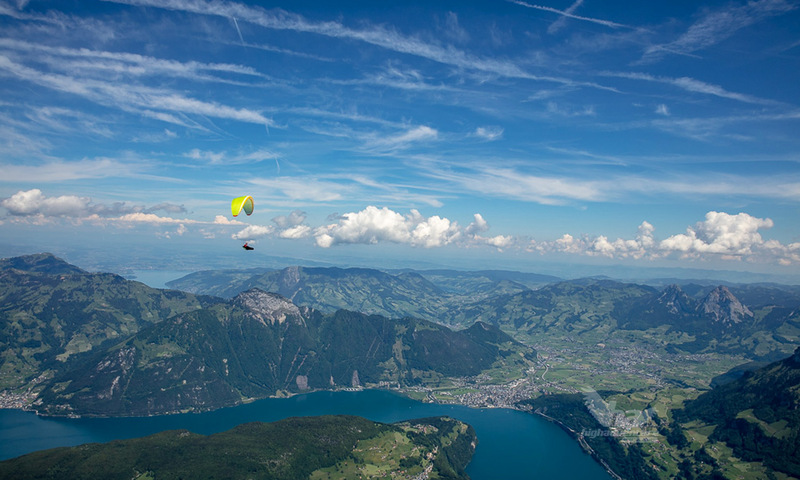 As Swiss Hanggliding Federation-expert and reserve parachute designer for High Adventure-Reserves, Urs Haari and acropilot Simon Bärtschi are responsible for the Beamer 2. Our goal was to improve the established properties as well as to significantly reduce weight and volume. Extensive research, field tests and experience from pilots all over the world ran into the design process. After one and a half years of development we present an entirely new controllable rogallo reserve. The properties of the Beamer 2 are impressive; the improvements are striking and the advantage over alternative systems evidentiary. The Beamer 2 passed EN- and LTF-tests straightaway with sensational results: deployment time is less than 2 seconds and less than 4m/s sink when fully loaded with 130kg. We significantly reduced weight and volume of the 42 m2 rescue by using only the best fabric which is light, but still tough and durable. We also use new material for the lines. Many innovations which improve deployment time, sink rate and flight characteristics can be found in the design of the Beamer 2. The completely new brake concept controls the Beamer 2 in two stages: after deployment the brakes are drawn and the Beamer 2 sinks with very little horizontal speed. As soon as the pilot takes the brake handles, the brakes are released and the Beamer 2′s glide performance can be fully utilized. • When deployed the brakes are drawn, low horizontal velocity e.g. close to a cliff. • Variable positions of the brake handles. The rescue can be attached to the main karabiners or to the harness. In both cases the brake handles are optimally aligned. • Manufactured in EuropePatent applications are pending for several design details. Thanks to the particular shape and the special “Beamer-packing technique”, the rescue opens up to 50% faster than conventional round reserves. This packing technique makes it very improbable to get lines wrapped above the canopy.We already mentioned the newly developed opening position which reduces horizontal speed after deployment. This combination of a reserve which sinks vertically but also can be controlled and glide to a safer spot for landing meets the desire of many pilots. After deployment close to a cliff or in strong wind the Beamer 2 initially sinks almost vertically. Only if the pilot takes the brake handles it starts to glide forward. Deployment of the Beamer 2 is the same as with normal rescues (pull & throw). The Beamer 2 slowly takes horizontal airspeed even if the main glider is still attached to the harness. Because of this slow horizontal airspeed the main glider is slightly less loaded and can be kept in B-Stall with only one hand. The other hand is used to control the direction of flight. If the paraglider can be released fast (e.g. with a fast release system) the Beamer 2′s characteristics can be fully utilized. Glide performance doubles and sink only increases very little. The Beamer 2 can be fitted into an outer rescue container (e.g. all High Adventure models in size M) or into an integrated rescue container. Depending on the type of container which is used, the rescue is installed to the main karabiners or to the harness. Important: To attach the rescue to the harness, appropriate straps on the harness are needed. Get answers to common questions about the Beamer 2. Do I have to separate my paraglider after pulling this reserve? No, the Beamer 2 can be controlled (video). Complex systems to quickly release your paraglider are not necessary. How does the Beamer 2 behave after opening without pilot input? Even if the Pilot is passive, the beamer works flawless. The rescue only has slow horizontal airspeed and even a furiously rotating main glider cannot break its calm. Can I control the Beamer 2 without having to release my paraglider? Yes, the main glider can be held in B-Stall with only one hand. With the other hand you can control the reserve. 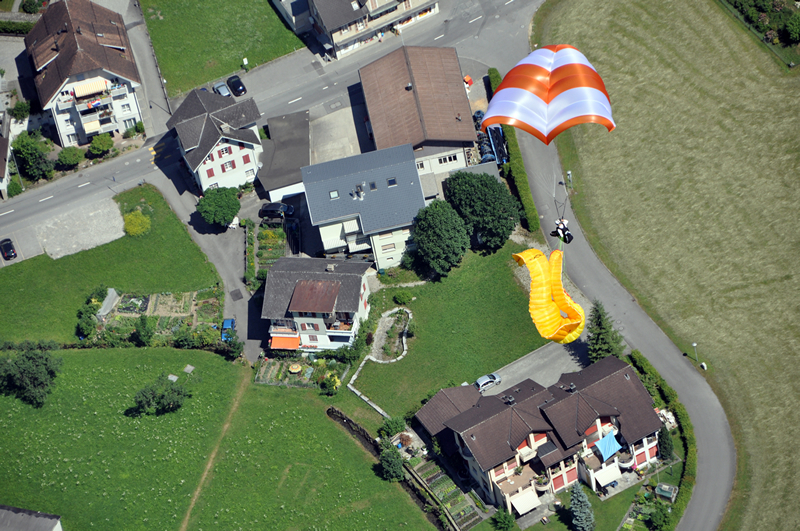 With enough altitude over the ground, the pilot can also pull the paraglider in. 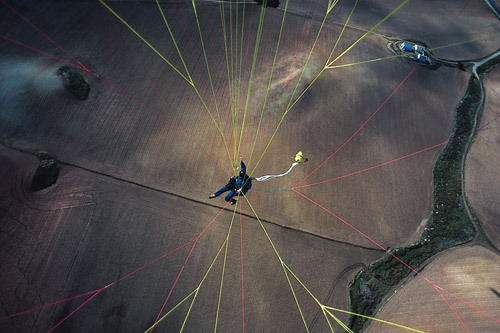 What happens if rescue and paraglider get tangled? In a worst case scenario you will end up in a situation similar to conventional rescues. Advantages of the Beamer 2 are the quick opening behaviour and low sink because of its big area. Is packing the Beamer more complex than packing a conventional rescue? The packing technique is different, but not at all more complex. Due to the growing acceptance for rogallo rescues in the scene, an increasing number of declared rescue packing experts can pack the Beamer 2. Can I use the Beamer 2 even though my in flight weight is 70kg? 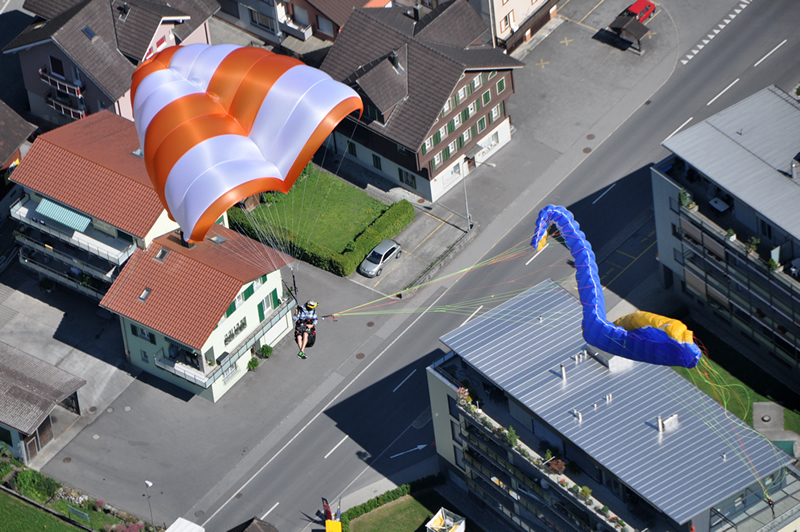 Flight characteristics and controllability are trouble-free with 70kg. Sink and velocity is decreased compared to heavier pilots. 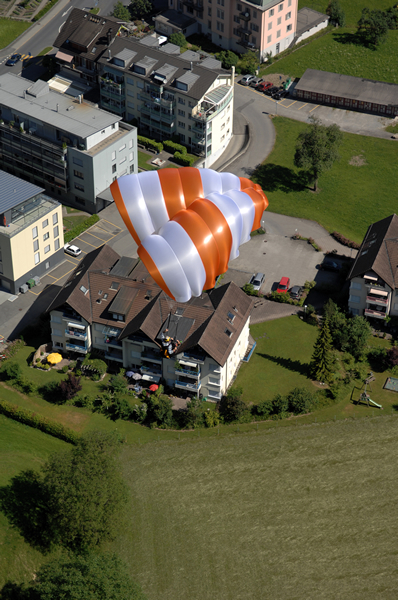 The opening time of the Beamer 2 can keep up with the quick opening times of conventional round rescue parachutes. Can I use the Beamer 2 in a SIV training over water? Yes. 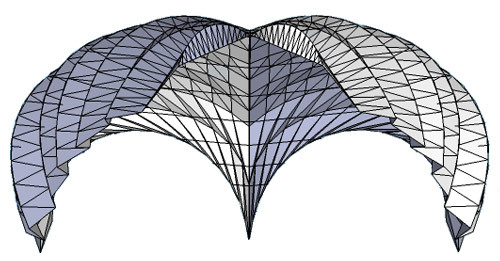 We deliberately abandoned ultra light, cheap material. 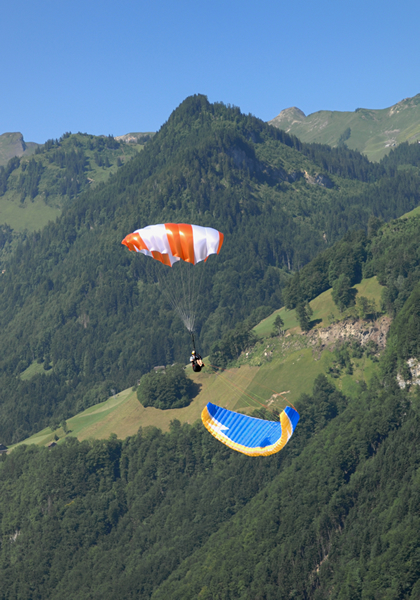 Fabric and lines are high quality, durable and well-proven in parachute sports.